The consequences of not eating a healthy breakfast don't just affect you during the morning hours before lunch. It is proven that they have an impact on you all day long. By not eating a healthy breakfast, you cheat yourself all day. Several detrimental consequences affect your work performance and ability to focus. This is in addition to consequences that affect your health. There's always time for breakfast. If you don't think you have the time, you may just have to plan ahead or think outside the box to fit breakfast into your routine. By taking a few minutes out of your evening the night before, you can prepare simple things or lay items out for breakfast the next day. For instance, a breakfast casserole can be made the night before and provide a good breakfast for the next two or three days. Or, fruit can be cut up and prepared to take with you. Plan ahead and separate out a serving of dry cereal and set it with a banana, ready to grab on the go as you leave for work or school. It just takes a little planning to have a breakfast planned for on the run. There isn't just one answer to this question. It can include a variety of things all the way from whole wheat toast to a bagel and cheese to dry cereal to fruit to veggie pizza. Breakfast can be traditional or non-traditional; pre-packaged or cooked from scratch. It can takes a lot of time to prepare or be something you pick up and take on the go. 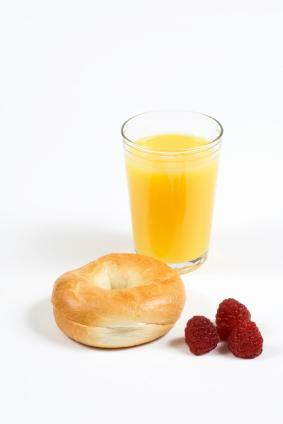 One suggestion offered by the Mayo Clinic staff is that a breakfast made up of a variety of food types is best. A good breakfast could include whole grains, fruit and low-fat protein or dairy sources. The clinic staff explains that this type of breakfast provides a person with complex carbohydrates, protein and a small amount of fat. They indicate that this type of breakfast sticks with someone for hours, putting off hunger pangs for much of the morning. When this type of a breakfast plan is followed, you're sure to feel better and more alert in the morning. By skipping breakfast, you're just setting yourself up to be tempted by unhealthy choices at work when hunger hits. If you don't give in to that hunger, when you go to lunch, you're apt to over-indulge due to being hungry. If the above type of plan doesn't work for you, it's perfectly alright to veer from this with other non-traditional foods such as a tortilla and salsa or a smoothie. Just make smart choices about the kinds of food you're eating. Above all, don't think you don't have time. You can even make wise choices when eating out and going through the drive through lane on your way to the office. Bagels, English muffins and other rolls aren't bad for you and are much better than croissants or doughnuts. You have choices that can lead to a healthy life and deter those unwanted consequences of not eating a healthy breakfast.